At the company where I worked for many years, there was a coffee maker in the IT area because, you know, nothing gets coded without coffee. I was a frequent visitor to the coffee station, but I wasn’t allowed to make a fresh pot. I got banned after a couple of disasters that left large puddles of hot java sloshed across the counter top. 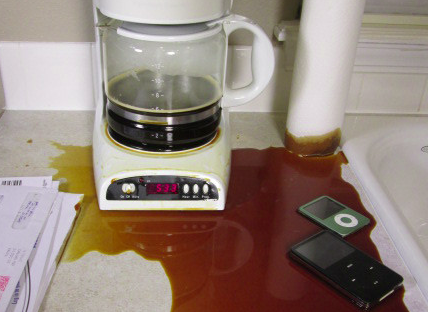 I’m apparently not the only person who can’t always effectively move coffee from the brewer to the pot. A company called Just In Case Deck has developed and patented a device that will capture the coffee overflow from a clogged brewing machine before it becomes a mess. The Just In Case Deck serves as a platform for an electric coffeemaker. It has a tapered top with open slots that will let any liquid that escapes from the machine drop safely into a collection chamber. The chamber is large enough to capture more than the full contents of a typical 14-cup coffee maker. The deck keeps spills away from the coffee machine’s electrical components and away from napkins, papers or anything else in the potential puddle zone. The deck will also collect moisture and liquids from other sources such as humidifiers or house plants. The Just In Case Deck sells for 29.95 at the Just In Case Deck website. You can see the deck in action in the video below and follow the company @JustInCaseDeck on Twitter.